Inlays and onlays are typically referred to as “partial crowns.” Unlike a full crown, which is used to replace the entire structure of a missing or decayed tooth, inlays and onlays replace a small portion of a tooth. Composite fillings should only be used when a small part of the overall tooth structure is missing. However, when a larger amount of the tooth structure is missing, using a composite filling is not a good choice, especially because the longevity of the installation is limited. Even though it may look nice, it won’t last as long. Also, larger white fillings tend to leak and decay because the material itself is limited. For greater longevity, it’s better to use custom-fabricated porcelain inlays and onlays. Not only does it look and feel better, it will also serve to strengthen the tooth structure, restore shape, and prevent further damage. We apply an inlay when there is no damage to the actual cusps of a tooth. Onlays are applied when the cusps of a tooth are effected and damage is more extensive. Inlays and onlays are more expensive than a chair-side white filling. However, it has more longevity. The cost is due to the fabrication involved. Inlays and onlays are also very technique-intensive. 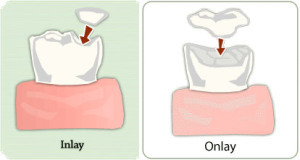 The tooth must be prepared for an inlay or onlay by removing the decayed or damaged area of the tooth. Then, a mold of the tooth is taken and sent to a dental lab, which will create a gold or porcelain replacement. This can take between two and three weeks. During that time a temporary inlay or onlay will be provided. When the custom fabricated inlays or onlays arrive they will be placed into your mouth and set with cement. Your tooth will look all-natural and neither you or other people will be able to tell the difference.